CIEGO DE ÁVILA, Cuba, Jul 5 2013 (IPS) - Houses with sturdy masonry walls and reinforced concrete roofs, looking like they could survive any tropical storm or hurricane, are sprouting up on the outskirts of this city in central Cuba, thanks to the development of local production of construction materials. “People in this neighbourhood, which is fairly new, have been improving their little houses. 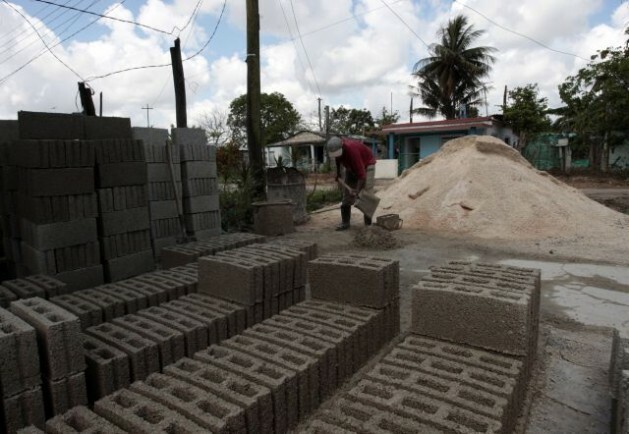 We support the neighbours and workers of the area, who buy the materials, and we lend them the block-making machine,” said Arcides Pérez, the owner of a small block-making factory. “We only charge them for the electricity used,” he told IPS. Two cement mixers, wheelbarrows, spades and an electrically driven machine turning out two blocks a minute are operated by seven men, while two women work finishing the blocks and preparing the raw materials. The team offers transportation of the tanks and installs them on rooftops or as cisterns. spectively, to pick up discarded rubble that they then mix with cement bought in state stores to make their blocks and tanks. Housing construction is a priority in Cuba’s current economic reforms. Among the first changes was the sale of construction materials in national currency, diversification of supply and provision of credits and subsidies for low-income families. The authorities hope that within two years, 70 percent of the productive activity in the housing sector will be carried out by private actors, as they seek to revitalise a sector that has been centralised by the state for decades. A good proportion of homes are in need of structural repairs, owing to the deterioration of housing stock caused by the economic problems Cuba has experienced for over 20 years, non-fulfilment of building programmes, the high prices of materials and labour, and damage from cyclones that frequently strike this Caribbean island. Sandy, the hurricane that hit the eastern part of the island in October 2012, damaged 137,000 homes in Santiago de Cuba, 65,000 in Holguín and 8,750 in Guantánamo, the other two cities most affected in the area, according to a report by the Cuban office of the United Nations. Extreme weather such as torrential rainfall will increase due to climate change in the Caribbean region, where the housing sector has received the least attention in the last decade, according to the Economic Commission for Latin America and the Caribbean (ECLAC). Storms and extreme weather events will tend to increase at a faster rate, meteorologist José Rubiera told IPS. In 2008, hurricanes Fay, Gustav, Ike and Paloma wreaked the most destruction on record since 2001, damaging 647,111 houses in Cuba, of which 84,737 were totally demolished, according to the state National Office of Statistics and Information (ONEI). Given this scenario, the main challenge remains boosting production of construction materials, a problem that is beginning to be met by local solutions. Private initiatives like Pérez’s are increasing the limited access to building blocks, one of the materials for which there is greatest demand at the state stores. “We sell blocks at five pesos (25 cents of a dollar) apiece, the same as the state,” said Pérez. “Securing the materials is problematic because there are shortages in the stores. For the last three months I have only been repairing and building tanks, as well as transporting and installing them, because of the lack of cement,” he said. Sixty-year-old Rodobaldo Ibarne, employed at a state construction firm, decided to make blocks to order privately. Equipped only with a spade, a wheelbarrow and a mould, he and another worker turn out up to 80 blocks a day in Grego, a neighbourhood on the outskirts of the municipality of Ciego de Ávila. “The state stores cannot keep up with demand,” Ibarne told IPS. He cannot expand his business because of health problems and lack of space. Production of several basic materials in Cuba fell in 2012, according to the latest figures from ONEI. Metal roofing sheets, asbestos cement tiles and black steel beams declined the most. In 2011, 32,640 housing units were built in the country, while 32,103 were completed in 2012. To improve housing, researcher Fernando Martirena is designing more ecological and economical construction materials to be mass-produced. At the same time he is strengthening production and using local capabilities by creating small ecomaterials workshops. Siguaney, a factory in Sancti Spíritus, began production in April of the first 240 tonnes of ecological cement developed by the state Centre for Research and Development of Structures and Materials (CIDEM), headed by Martirena, at the “Marta Abreu” de Las Villas Central Univesrsity in Santa Clara. The product, made from metakaolin (obtained from the mineral kaolin) and unheated limestone, will be marketed from 2014. “It cuts production costs by 28 percent and contributes to mitigating the effects of climate change by reducing carbon dioxide emissions during the manufacturing process,” Martirena told IPS. CIDEM has worked directly with Cuban communities since 1995 on a low-energy system for local production of recycled construction materials, like micro-concrete roof tiles, CP40 pozzolanic cement, prefabricated materials, red ceramic aggregates and bricks, and other appropriate technologies for rural and peri-urban areas.